We all have heard a lot about Windows Vista being a resource hog & it using almost every single bit of RAM installed in our system. The task manager ‘proves’ this by showing very less Free RAM. Most of the people panic when they have a look at current system resources. Don’t worry! This is how Windows Vista works & it’s better than Windows XP. To understand how it is better, I’ve written the internal working in simple language which, even a newbie can understand. SuperFetch in Windows Vista is an enhancement over Prefetch in Windows XP. Prefetch, in Windows XP, stored program information in memory so that often used programs can run faster. SuperFetch is an evolution of Prefetch. SuperFetch tracks the often used applications & loads their information in your system RAM which results in faster loading of those applications. SuperFetch is implemented in “%SystemRoot%\System32\Sysmain.dll” & runs in Service Host process (%SystemRoot%\System32\Svchost.exe). Here’s an example to show you how SuperFetch works – You leave your system idle for some time & when the system was idle some heavy background process like Disk Defragmenter starts running. The Disk Defragmenter overwrites the data in RAM for its own activities. In previous versions of Windows, you would have noticed that your computer becomes slower or is performing sluggishly after such heavy, memory intensive tasks. 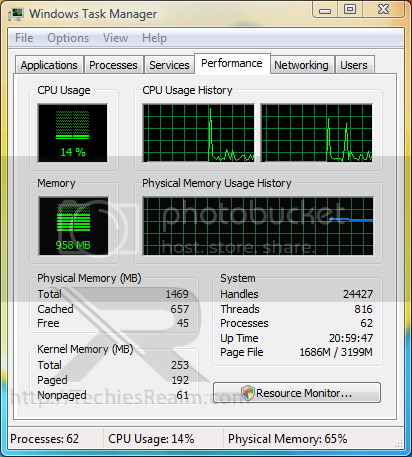 However, in Windows Vista, SuperFetch uses memory manager to fetch the data which was flushed from the memory for the memory intensive task. SuperFetch stores that fetched data or code in a file which are known as scenario files in a low priority operation so that it doesn’t affect other active applications or processes. These scenario files are stored with .db extension in “%SystemRoot%\Prefetch” directory. SuperFetch brings back the stored data in scenario file back into system memory or RAM after that memory intensive task is completed during the idle time. SuperFetch tries to use system RAM to the maximum extent for caching purposes & doesn’t waste free RAM by not using it. This is the reason why Task Manager shows very less free memory even if the used memory is pretty much less than the installed memory. The data in cache is flushed out when a process or an application needs memory to run itself. In simple terms, the memory is being used for caching but it appears as free to processes or applications. So the memory hog myth is busted, now let’s move on to ReadyBoost. To improve system performance, adding RAM is often considered one of the best options. However it is not possible in some cases like no more free slot available for adding RAM or in case of lack of finances as it’s not cheap. In such scenarios, we can use Windows ReadyBoost, a new concept in Windows Vista. It can be used as an alternative to RAM. We can use non-volatile flash memory devices such as USB Pen Drive or Secure-Digital (SD)/MMC/CF Cards for ReadyBoost. Hard Disk Drives have better speeds in large sequential Input/Output operations & ReadyBoost is not used in case of large files. However the USB based NV Flash memory provides better throughput in case of smaller files. A device must be compatible to work with Windows ReadyBoost & you can use 1 such device per system. ReadyBoost with the help of SuperFetch stores small amount of cache data from hard disk’s virtual memory & copies it to the flash drive. As it is copied, even if the device is unplugged no data is lost. These small pieces of data can be accessed faster from the flash drive than the hard disk which results in boosting of speed of the system. The data copied on the ReadyBoost device is compressed to the ratio of 2:1 & is encrypted with AES-128 level of encryption & you need not worry about the security of your data. With this compression ratio, a 4 GB drive can have upto 8 GB of data in typical scenarios. The increase in speed of a system varies from system to system & the type of usage. You can see major speed boost in systems which have 512 MB of RAM (the minimum requirement) or in systems where the physical memory is heavily used & more memory is required for better operations. However you won’t see much difference in systems which have sufficient memory for operations. There is major speed boost in systems which have lower speed (5400 RPM or less) hard disk drives such as laptops. Windows Vista Service Pack 1 is reported to have performance improvements in ReadyBoost. It must be at least USB 2.0 compatible. The minimum capacity of the device must be at least 250 MB after formatting. It must have 230 MB of free space. For better results, the size of the device must be equal or greater than the system RAM. It must have access time of 1 ms or less. Most devices have 1 ms of access time. It must meet the speed requirements of ReadyBoost. It must have random read speed of 2.5 MB/sec for 4 KB uniformly across the entire device and 1.75 MB/sec random write speed for 512 KB uniformly across the device. FAT16, FAT32 & NTFS are the supported file formats for the USB device. 4 GB flash memory is the maximum supported capacity for ReadyBoost due to limit of FAT32 file system. To enable ReadyBoost on your system, please read ReadyBoost your System.